The initial facts concerning the foundation of Psi Chapter date back to 1865. Delta Psi Theta was a fraternity on campus that existed at this time. This was not a nationally recognized fraternity, and perhaps may have been a local fraternity or one with a handful of chapters in Indiana. This fraternity had several similarities to the International Fraternity of Phi Gamma Delta. For example its pin was strikingly similar to the FIJI pin. In December of 1865, 17 members of Delta Psi Theta chose to resign for unknown reasons. On June 1, 1866 these seventeen men decided to petition Phi Gamma Delta for a Charter. They began this chartering process by first approaching the Lambda Chapter at DePauw University. A charter was granted on June 19, 1866, and thus began the long and storied history of Psi Chapter. In the early years of Psi, Chapter meetings were held every week on Friday at the home of a member or in the rooms of South Hall, which served as a dormitory in the 1860’s. In October 1869, Thomas Riley Marshall 1873, joined Psi Chapter. He later served as Governor of Indiana (1909 – 1913) and was Vice President of the United States to President Woodrow Wilson (1913 – 1921). The three fraternities on campus at that time all existed in secrecy because the College did not officially support them. They however, ignored their presence and allowed them to continue meeting. Psi continued to meet in the rooms of its members for its first nine years until 1875 when they acquired a Chapter hall. This hall was acquired in November, and it was located on the third floor of the Fisher Block Building on the corner of Main and Green streets. Members of the fraternity in the early days were known as “Deltas” or “Phi Gams” because the term FIJI was unknown at this time. In 1893 Psi Chapter moved from the third floor of the Fisher Block to the third floor of the Campbell Block on the corner of Main and Washington. This hall was larger than the previous one, which gave the men room to dance. The origins of pledgeship came in 1899. Previously, new members were selected and then they were immediately initiated. This pledgeship varied in time. There was talk of purchasing a chapter house that dates back to 1892, however no action was taken until the spring of 1902, when Psi purchased the old Van Sickle home at 207 South Grant. This was the first fraternity house on Wabash College’s campus. Along with the purchase of the house, the Wabash College Phi Gamma Delta Association, a/k/a the housing corp., was established. They would meet annually and discuss matters pertaining to the management and operation of the House. In this year, Psi also played a critical role in the chartering of the Lambda Iota chapter at Purdue University. The men lived, studied, and slept in the House but did not eat there until 1908. In 1904 Psi Chapter began a tradition of carving of names into the tabletops, which was adopted from Stanford. There was an annual dance every year at the College known as the Pan. Fijis were banned from the dance in 1910 because the previous year they left during intermission with their dates to go back to the house at 207. They had a dinner and a lot of fun and ultimately returned late, which made the other fraternities mad. However, Psi didn’t give in so they decided to have their own Pan dance. This dance was a huge success and nearly 100 people attended. Subsequently, the Fijis were allowed to take part in the pan in 1911. The Fijis began to excel academically during this time in the new house. One brother in particular, Jake Schramm ’10, who won Phi Beta Kappa honors, received the highest grade point average any man in the College had made in twenty years. He also graduated in three years. In the Fall of 1922 the House at 207 South Grant burned. The original Psi Charter was destroyed in the fire and PSI began a period of nomadic year as the Chapter moved from the House on 207 to 1107 West Wabash. Unfortunately, the West Wabash house burned, so the Chapter moved to the old Gerard home on East Main until 1926. During this period the graduate brothers were making plans for a new Chapter house at a site on the corner of Jefferson and Grant. Construction on the new House started in 1925 at 213 West Jefferson. The House was finished by the fall of 1926 in time for the Chapter to move in for the new school year. 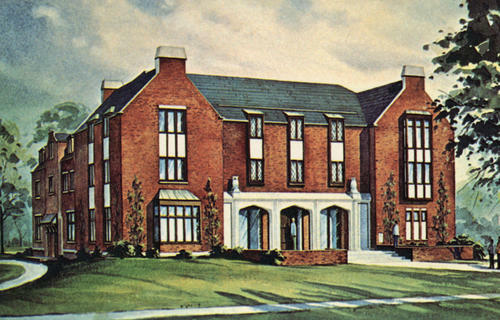 It was reported that the Phi Gam House had no peer on the Wabash campus as it was the first house built for the purpose of being a fraternity house. In 1929, a large portrait of Thomas Riley Marshall 1893 was donated to the Chapter by Phil Leffel 1914. It is one of the few portraits of Marshall in existence and presently hangs in the foyer of the Chapter House. The bombing of Pearl Harbor and subsequently the beginning of the Second World War induced many changes in the house. In April 1943 it was reported to the Chapter that an inventory of the house must be made because the college was going to house Navy men. So it was on July 1, 1943, when the Navy V-12 program began. Psi Chapter became company 4, a Navy Barracks. The House also became known as Ship Phi Gamma Delta. The Navy left in October 1945 and after repairs the brothers were able to move back into the house in the spring of 1946. Brother Gene Burks ’43 returned to the House after the war as the most decorated Wabash man in WWII. He received the Distinguished Silver Cross. In 1949 Harry Wright Duckworth 1892, a very loyal and dedicated brother, died. In his will he left $65,000 to Psi Chapter. At this time, it was the largest single gift received by any FIJI chapter. In 1952 Psi Chapter once again captured the Cheney Cup for the 1950-1951 academic year. Also in 1951 the house received its seven foot tall grandfather clock, donated by Brother John A. Martin 1927 which presently sits in the foyer by the entrance to the Library. The actual capture of the Monon Bell during the Mexican bell heist of 1966 was successfully completed by FIJIs. Around dinner time 8 brothers, one moid, and one independent went to Greencastle to steal the bell. They knew of the location because of prior reconnaissance. These brothers went down to the Quonset hut on DePauw’s campus, which is where the bell was stored. They removed a window from the hut and entered the building. They found the bell and loaded into one of the Brother’s car. They brought it back to campus and stored it at one of the Brother’s house who lived in Crawfordsville. Eventually, they gave the bell over to Dean Moore. However, if you ever get a chance look inside the bell and you will see a Greek psi engraved in the metal. As Psi approached its Centennial year of 1966, talk of building a new house circulated among the graduate brothers. In 1965, long time Wabash trustee and Psi advisor, John P. Collett 1924, donated two large great horned owls sculpted from Vermont marble. The owls were placed on the front of the House and incorporated into the design of the “new” house being considered by Psi. During this time there was much discussion among the fraternities at Wabash about the merits of deeding the fraternity houses to Wabash College so that gifts for renovations and construction of new buildings would be tax deductible for the donor. John Collett was a major proponent of giving the houses to the College. At the September 1968 meeting of the Board of the house corp., it was decided to deed the Chapter House to Wabash College as part of the fund raising plan for the renovation of the existing house and the construction of a new addition in front of 213 West Jefferson. Estimated cost of the project was $461,363.00. Work began on the addition in 1969 with the Chapter living in the existing house during construction. When the new addition was finished, work shifted to the 1926 structure. It was reported as a time of great chaos with workmen, noise and cramped quarters for the Chapter until the completion of work in 1970. The new house at 213 Qwest Jefferson was dedicated on April 24, 1971. In 1979, Brother Bill “Abe” Diddel 1908 was considered Wabash’s greatest living athlete and the College staged the Abe Diddel Night at the home basketball game against Depauw. Diddel was a letterman in four sports, who in his time was considered the greatest basketball player in the U.S.A. He was also a member of the “Wabash Wonder Five” which was once considered the champion basketball team of the world. Diddel was also an accomplished golfer, who designed many golf courses in the Midwest. Beginning in 1997, the graduate brothers began discussing renovations to 213 West Jefferson with Wabash College. Initial estimates of renovation quickly climbed from $1.75 million to over $4 million. As the cost of renovation grew, the College pressed Psi to consider building a new house rather than renovating 213 West Jefferson. Negotiations with Wabash resulted in the acquisition of the site next door with the plan being to have the front door match up with the driveway leading to Center Hall. The House was designed by Brother Jim Riddle ’86 who is an architect and devoted graduate brother. The total cost of the construction of the new Chapter House was $5 million. Brother Don Smith ’59 was the major contributor to its funding, and without him the new building could not have been built. Psi broke ground on the new house on April 4, 2005. The Chapter remained at 213 West Jefferson during construction and moved into 414 South Grant in the Fall of 2006. The new Chapter House was dedicated on September 23, 2006. We always keep in mind the brothers that have come before us and the legacy we will leave to those yet to come.